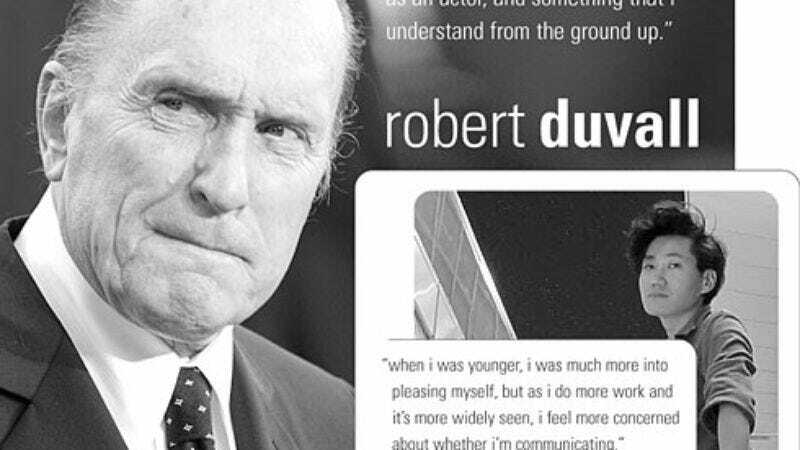 Equally adept at brooding subtlety and showy grandstanding, Robert Duvall has been one of cinema's most consistently remarkable actors for more than four decades. Duvall made an unforgettable film debut playing the slow but gentle Boo Radley in 1962's To Kill A Mockingbird, and from there, he took on steady character work in movies like Bullitt, True Grit, and M*A*S*H. In the '70s, Duvall earned three Oscar nominations, including two for diverse roles created for director Francis Ford Coppola: his indelible portrayal of the Corleone family's quietly efficient consigliere in 1972's The Godfather, and his larger-than-life turn as a Wagner- and surf-loving Colonel in 1979's Apocalypse Now. More accolades and solid roles came throughout the '80s, including his Oscar-winning portrayal of a down-and-out singer in Tender Mercies and his aging cowboy in Lonesome Dove. In 1997, Duvall made perhaps the biggest gamble of his career when he wrote, directed, starred in, and personally financed The Apostle, a moving, beautifully observed character study about a flashy minister. A critical and commercial success, Duvall's venture paid off, and he recently released his follow-up directorial effort, Assassination Tango, in which he stars as a tango-loving hitman sent to assassinate an Argentinean general. The Onion A.V. Club recently spoke with Duvall about his directorial career, his admiration for Ken Loach, and the intrinsic appeal of Buenos Aires. The Onion: How did you become interested in the behind-the-scenes aspect of filmmaking? Robert Duvall: It was the '60s or '70s, I was in Nebraska working with Francis Ford Coppola on The Rain People, with Jimmy Caan, and I met an interesting family of people, trick riders. After that, I came back six times over a two-year period to do kind of a documentary on this family, called We're Not The Jet Set. That got me into wanting to do some films, and I've done four altogether. O: What about their lives interested you? RD: It was very specific to that part of the country, but even in that part of the country, they were unique among their friends and peers. I just wanted to document that and put it on film, because even as an actor, you try to represent different parts of the culture of your country, or foreign cultures. That was what I wanted to do then, and since then, each project has dealt with a specific community or a different culture. O: How does acting in a film you're directing differ from acting in a movie someone else directs? RD: It's the same. Instead of having someone up there saying, "What do you think? Would you like to do another one?" you say, "I'm feeling pretty good. How do you feel? I'm satisfied with it. Let's move on." Instead of having somebody out there saying that to you, it's more like a mental check. When you've done enough, after one or two or three times, you know that it's okay. You can look at the monitor, too, and that helps a bit. O: Does it make it harder or easier to act when you're directing yourself? RD: It's harder but easier. It's supposed to be more difficult time-wise, health-wise, sleep-wise, everything, but I feel more exhilarated at the end of the day doing both than I do just acting, where you sleep in between takes and when they're ready for you they knock on your trailer door. When you're doing both, you're always on the move. I like to work quickly. Like on Assassination Tango, the guy said, "We'll set up the shot and call you when we're ready." So I'd be reaching for my tea and they'd already be ready. They were that fast, and I like to work fast. On The Apostle, too, we worked very fast. O: How did The Apostle happen? RD: Way back when I was doing an off-Broadway play, I was in Arkansas, near Memphis, and I went back to see a friend. That night, the sheriff gave me a funny look, and there was no place to sleep, so these highway workers let me bunk in with them. It was a nice little town. All the stores were owned by Chinamen in this little town in the middle of the South. I didn't know what to do, so I wandered into a little white church and saw my first Pentecostal service, and I thought it was really something, culturally and spiritually. I thought, "Someday, I'd like to play one of these people," so I developed a screenplay. O: Did you do a lot of writing before that? RD: No, no. Anything I try to do, I figure, has to be an extension of myself as an actor, and something that I understand from the ground up. I can't just do anything—it has to be something that I understand. I couldn't be a writer for hire, because I wouldn't know how to do that. It has to come from myself as an actor. O: Did it take a long time to go from writing to filming with The Apostle? RD: It did. Everybody turned it down. Eventually, my CPA greenlit the movie. [Laughs.] With the Tango movie, I put it in the drawer and left it for a while. When I took it out, the second person who saw it was Coppola. He saw it and liked it, so he bit. O: Is there any particular director who influenced the way you direct? RD: I found my own way, but I like some of the Iranian films. I liked the film The Apple, about a 17-year-old. But I would have to say, I keep going back to Ken Loach. I like the way he works. He listens rather than looks. I like the way he gets behavior, and he does improvisation in a good way. If an actor gets stuck, he can help them in certain ways. Certain directors give freedom, and I've worked with them. But I've noticed that sometimes when actors get stuck, the director doesn't necessarily know how to help them. A director who gives you freedom but can also help an actor who gets stuck, that's the kind of guy Ken Loach is. O: What's it like being directed by Coppola? RD: Coppola's good, too. He lets you come in with stuff. He's very good with stories. With The Godfather, he picked very good actors and let them try things, and he'll suggest things. He gives you a nice freedom, as good directors do, and doesn't say, "Do it this way!" [Pounds on table.] Some of the old-timers did. O: When you first read the script for Apocalypse Now, did you realize what an impact your character would have? RD: I don't know about that. I thought I might like to play it, but they offered it to somebody bigger than me. Then he turned it down, so they only had to ask me once. The name of the character that John Milius had written was originally called Colonel Carnage, so they tempered that down from Carnage to Kilgore. O: Do you think it takes a certain temperament or personality to be an effective director? RD: No, there are all kinds. Some yell, some are quiet, and you like to look for the quiet ones. The ones that can be buffaloed, that's not so good, but there's all kinds. I know a guy who worked with [Roman] Polanski, and after three weeks, he just quit. There could have been legal repercussions, but he just quit because the guy was a maniac to work with. But Polanski's a talented guy. My favorite film of the year was The Pianist. O: Who's been the most difficult director you've worked with? RD: I don't know. They're okay. Way back, old Henry Hathaway in True Grit said to some actor, "When I say action, tense up, goddammit!" You don't want somebody to tell you in a scene to tense up. But you're trying to find ways to work with one another, and you try and find common ground. O: In the films you've directed, you've worked with a lot of non-professionals. What's the appeal of working with them? RD: The appeal is that once you get them to a certain level, they'll put a professional actor on notice. They'll be just as pure and good, and they have no bad habits. They bring something fresh. And you try to populate your film with people from the community you're filming about, making actors out of them. I used to go to Pentecostal churches in the South and say, "She looks interesting," and make actors out of them. If they're willing to do it, and they're willing to try it, then you get them loosened up and let the process come from them, and you get good stuff. You get gems. O: You obviously played a memorable character in your first film, To Kill A Mockingbird. Were you worried that you'd get typecast? RD: No. I've always had the good fortune to get different kinds of parts. But it was a special guy, Horton Foote, who helped me get the role. He wrote the screenplay. I remember when I went up to do it, Harper Lee—I think that was the only book she ever wrote—sent me a telegram that said "Hey, Boo." It's a nice part, and it was a nice project to be part of. O: What made you want to make a movie about the tango? RD: I just have always liked the tango, and I began to piece together an imaginary story connecting the world of social dancing to the underworld. The best dancer in Brooklyn was a mambo guy, and also a wiseguy. In Buenos Aires, they get that. It's a myth, but they used to say that you'd be a good dancer if you were from the underworld. It's true that some underworld guys are good at dancing, but a guy from a bank, or an interviewer like yourself, can also be a good dancer, if you're a talented individual. So I tried to connect social dancing to the underworld. I didn't know why he'd go to Argentina, but then I thought, "Why not have him knock off one of the generals?" O: Were you interested in Argentina's political situation? RD: It interested me to a point, because it's a corrupt country. I don't know if it's institutionalized, but I think it's what brought the country down. O: You have a home in Argentina. How would you compare living in Argentina to living in America? RD: I'd never give up my country. I'm an American. But down there, I must say, at 2 or 3 o'clock in the morning in Buenos Aires, hundreds of people are in the streets and drinking coffee. There's something there that's not in this country, and I like that a lot. They get up kissing, and when they finish, it's lunchtime. They can be arrogant but warm. The French are arrogant and arrogant. In Buenos Aires, they kind of look to the French somewhat, but I love it there. I like that city more than any other city, because you can go to coffee shops at any time of the day. There's something about it. I've grown used to it, and I've been accepted there. O: You financed The Apostle yourself. Were you worried? RD: Well, I just jumped in and hoped for the best. It was almost sabotaged by one of the guys bidding on it, but we got our money back plus. I didn't make a lot of money, but I felt great because I got it done and got October Films behind it. O: It doesn't exactly have the most commercial subject. RD: Yeah, well, they could have put it in twice as many theaters as they did, especially in the Bible Belt. O: How did winning the Academy Award for Tender Mercies affect your career? RD: It didn't really affect it one way or the other. It was nice to win. That was it. It's okay, but it didn't do anything special. O: Didn't it give you any kind of leverage? RD: Not really. I went in right after that and tried to get money for The Apostle, but couldn't get it. Couldn't get a cent. But it's better that I did it years later, because it seasoned and got richer. O: Why was it was so difficult to get that film financed? RD: Other actors have had the same experience. They'd rather do a schlocky project about the same thing you're going to do and pay you big money and not help you finance this one. It's a funny irony, but actors have always had problems getting money for independent movies. O: How would you compare making Assassination Tango with making The Apostle? RD: Well, it's two very different subjects, but using the same sort of process. It's two things that interest me very much. The same people you might use in a documentary, if you're doing a documentary, you can use in the fiction form. So I try to go from that aspect. Both were very enjoyable, and I liked doing both of them. O: Do you get recognized a lot? RD: Sometimes. Always enough to be flattering, but never enough to be a nuisance—not like Tom Cruise or those guys. They can't walk down the street. O: What do you generally get recognized for? RD: Boombox kids are like, "Hey, man, I seen you in Colors." Guys from North Carolina recognize me from Days Of Thunder. Different things, but a lot of people recognize me from Lonesome Dove. In the city and the country, especially in the West among cowboys, they'll tell you, that's the one. O: What films of yours do you think have been overlooked or underrated? RD: Everybody always goes way back to The Outfit. Underrated? Overlooked? Maybe True Confessions, which is overlooked in that people love it, but people tend to go for the obvious ones, critics and the public alike. So what? That's life. O: It seems like at this stage in your career, you've already done just about everything an actor can do. Are there any things you haven't done yet but would like to do? RD: I'd like to direct more, but I don't have any projects going. Around the corner, there's always something. I just did a Western with Kevin Costner. It's a great part. Almost equal to Lonesome Dove, which is my all-time favorite. I play a trail boss. It's a traditional Western, and it's going to be nice, I think. I hope.